Aquaculture is the farming of fish, shrimp, and algae, and other seafood. Aquaculture supplies fish, such as catfish, salmon, and trout. 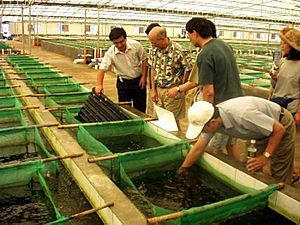 Aquaculture was developed a long time ago in China and aquaculture supplies over 20% of all the seafood harvested. Aquaculture is quite a new activity in Canada as it only began in 1879. Microalgae, also referred to as phytoplankton, microphytes, or planktonic algae, constitute the majority of cultivated algae. Macroalgae commonly known as seaweed also have many commercial and industrial uses, but due to their size and specific requirements, they are not easily cultivated on a large scale and are most often taken in the wild. 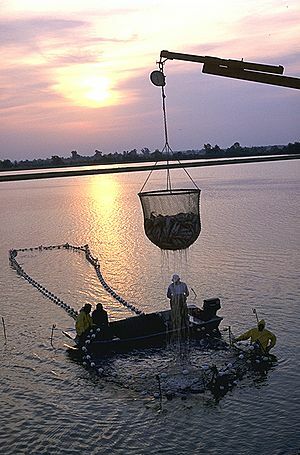 The farming of fish is the most common form of aquaculture. It involves raising fish commercially in tanks, fish ponds, or ocean enclosures, usually for food. A facility that releases juvenile fish into the wild for recreational fishing or to supplement a species' natural numbers is generally referred to as a fish hatchery. Worldwide, the most important fish species used in fish farming are, in order, carp, salmon, tilapia, and catfish. In the Mediterranean, young bluefin tuna are netted at sea and towed slowly towards the shore. They are then interned in offshore pens where they are further grown for the market. In 2009, researchers in Australia managed for the first time to coax southern bluefin tuna to breed in landlocked tanks. Southern bluefin tuna are also caught in the wild and fattened in grow-out sea cages in southern Spencer Gulf, South Australia. A similar process is used in the salmon-farming section of this industry; juveniles are taken from hatcheries and a variety of methods are used to aid them in their maturation. For example, as stated above, some of the most important fish species in the industry, salmon, can be grown using a cage system. This is done by having netted cages, preferably in open water that has a strong flow, and feeding the salmon a special food mixture that aids their growth. This process allows for year-round growth of the fish, thus a higher harvest during the correct seasons. An additional method, known sometimes as sea ranching, has also been used within the industry. Sea ranching involves raising fish in a hatchery for a brief time and then releasing them into marine waters for further development, whereupon the fish are recaptured when they have matured. 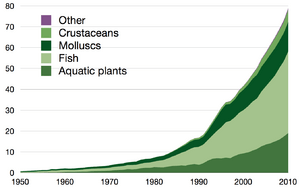 Commercial shrimp farming began in the 1970s, and production grew steeply thereafter. Global production reached more than 1.6 million tonnes in 2003, worth about US$9 billion. About 75% of farmed shrimp is produced in Asia, in particular in China and Thailand. The other 25% is produced mainly in Latin America, where Brazil is the largest producer. Thailand is the largest exporter. Shrimp farming has changed from its traditional, small-scale form in Southeast Asia into a global industry. Technological advances have led to ever higher densities per unit area, and broodstock is shipped worldwide. Virtually all farmed shrimp are penaeids (i.e., shrimp of the family Penaeidae), and just two species of shrimp, the Pacific white shrimp and the giant tiger prawn, account for about 80% of all farmed shrimp. These industrial monocultures are very susceptible to disease, which has decimated shrimp populations across entire regions. Increasing ecological problems, repeated disease outbreaks, and pressure and criticism from both nongovernmental organizations and consumer countries led to changes in the industry in the late 1990s and generally stronger regulations. In 1999, governments, industry representatives, and environmental organizations initiated a program aimed at developing and promoting more sustainable farming practices through the Seafood Watch program. Freshwater prawn farming shares many characteristics with, including many problems with, marine shrimp farming. Unique problems are introduced by the developmental lifecycle of the main species, the giant river prawn. The global annual production of freshwater prawns (excluding crayfish and crabs) in 2003 was about 280,000 tonnes, of which China produced 180,000 tonnes followed by India and Thailand with 35,000 tonnes each. Additionally, China produced about 370,000 tonnes of Chinese river crab. Aquacultured shellfish include various oyster, mussel, and clam species. These bivalves are filter and/or deposit feeders, which rely on ambient primary production rather than inputs of fish or other feed. As such, shellfish aquaculture is generally perceived as benign or even beneficial. Depending on the species and local conditions, bivalve molluscs are either grown on the beach, on longlines, or suspended from rafts and harvested by hand or by dredging. In May 2017 a Belgian consortium installed the first of two trial mussel farms on a wind farm in the North Sea. Abalone farming began in the late 1950s and early 1960s in Japan and China. Since the mid-1990s, this industry has become increasingly successful. Overfishing and poaching have reduced wild populations to the extent that farmed abalone now supplies most abalone meat. Sustainably farmed molluscs can be certified by Seafood Watch and other organizations, including the World Wildlife Fund (WWF). WWF initiated the "Aquaculture Dialogues" in 2004 to develop measurable and performance-based standards for responsibly farmed seafood. In 2009, WWF co-founded the Aquaculture Stewardship Council with the Dutch Sustainable Trade Initiative to manage the global standards and certification programs. After trials in 2012, a commercial "sea ranch" was set up in Flinders Bay, Western Australia, to raise abalone. The ranch is based on an artificial reef made up of 5000 (As of April 2016[update]) separate concrete units called abitats (abalone habitats). The 900 kg abitats can host 400 abalone each. The reef is seeded with young abalone from an onshore hatchery. The abalone feed on seaweed that has grown naturally on the abitats, with the ecosystem enrichment of the bay also resulting in growing numbers of dhufish, pink snapper, wrasse, and Samson fish, among other species. Other groups include aquatic reptiles, amphibians, and miscellaneous invertebrates, such as echinoderms and jellyfish. They are separately graphed at the top right of this section, since they do not contribute enough volume to show clearly on the main graph. Commercially harvested echinoderms include sea cucumbers and sea urchins. In China, sea cucumbers are farmed in artificial ponds as large as 1,000 acres (400 ha). Aquaculture Facts for Kids. Kiddle Encyclopedia.